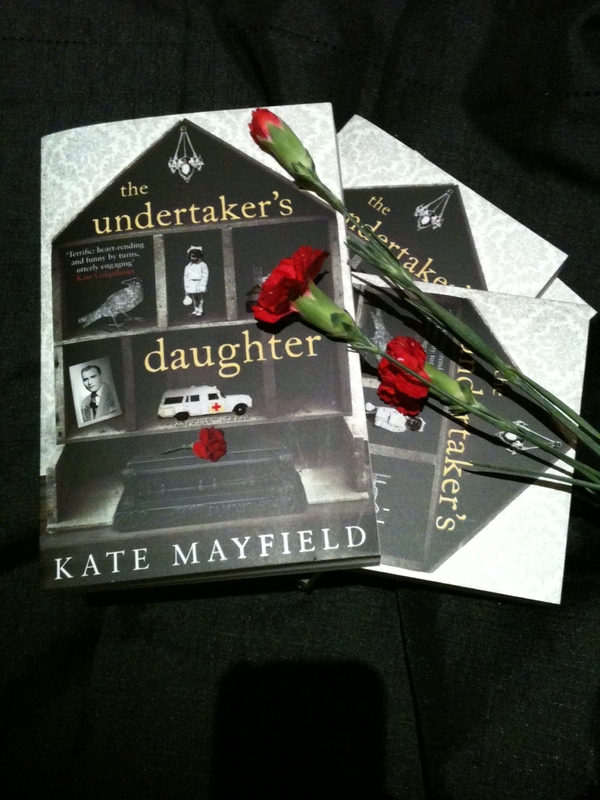 Kate Mayfield is the author of The Undertaker’s Daughter, published by Gallery Books in the USA and Simon & Schuster in the UK. After attending Western Kentucky University, Kate moved to Manhattan where she graduated from the American Academy of Dramatic Arts. She lived in New York and Los Angeles and now makes London her home. 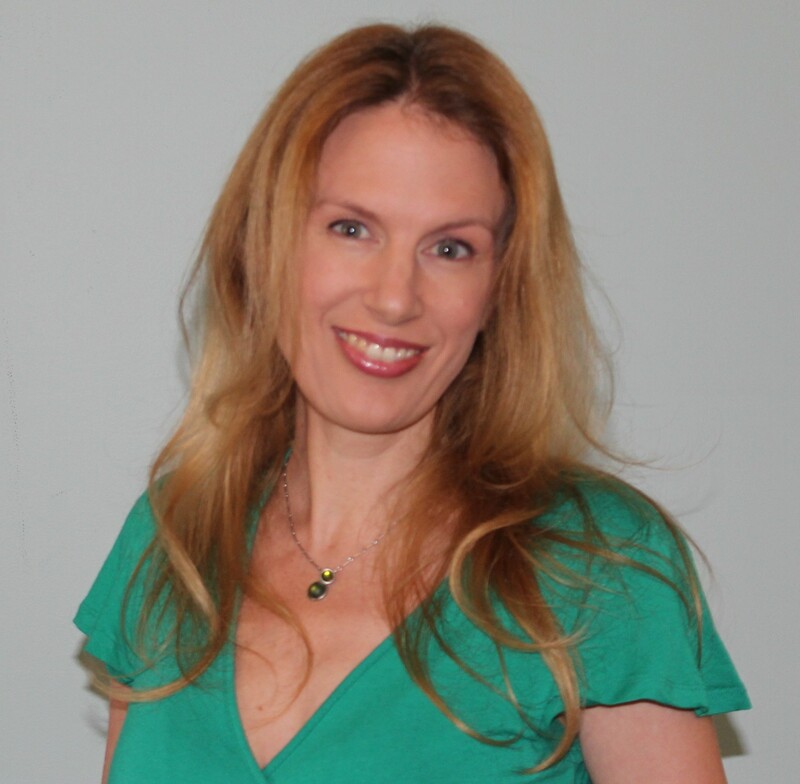 Kate is also the co-author of Ten Steps to Fashion Freedom, and Ellie Hart Goes to Work. When I was a child, an elderly woman who was a friend of my father’s gave me fifty cents each time she happened to see me, which was quite often. I began to feel guilty that I had nothing to give her in return, so I wrote her a poem. It was truly awful, stinky, terrifyingly bad. Wisely, I tore it into pieces. Years later when I lived in New York, I took my first trip abroad to Egypt. I bought a sturdy journal thinking I would keep a diary of my days traveling around the country. Instead of recording “this day I went here and the next day I went there,” I wrote about the way the light hit the stones of the pyramids, and the odor of the warm pita bread wafting by in a basket held on a woman’s head. The next day I was so embarrassed when I read it that I shredded the pages and threw the journal in a bin on a street in Old Cairo. So you see, it hasn’t been easy. Years passed before I was able to live with what I wrote. It was a single moment in which I was presented with an opportunity to co-write a book with my husband that I said, “I think I can do this.” And I did. I grew up in a funeral home in a small town in southern Kentucky where my father was an undertaker. This is the setting of my third book, a memoir, The Undertaker’s Daughter. I write in a small, home study. This is a photo of one of my bookshelves. 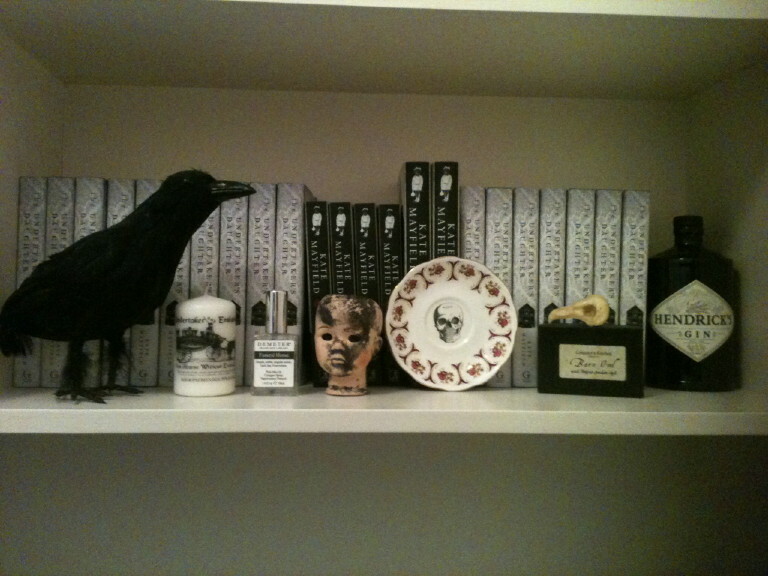 My Shelf of Curiosities holds a portion of my collection of odd things. I think you can see that a theme exists! It depends in which part of the publishing process I’m engaged in. At the moment I’m doing promotional events, visiting bookstores, writing guest blogs, participating in book club meetings—the sorts of things you do when a book has been recently published. I am working on a new book and when the business of promotion calms down I’ll be writing every day. I’ll divide my time between libraries and my study, which will gradually progress into very long days at my desk with scarcely any days off. I work with an outline. This applies to whether I’m writing fiction or nonfiction. I feel more comfortable knowing where I’m going even though it inevitably changes, sometimes quite drastically, along the way. I write quite a long synopsis, which I then show my agent. We discuss it and then I don’t talk about it much to anyone after that, except one trusted friend. I also edit as I go. Many writers don’t do that and say it interrupts their creative process, but it helps me delve back into the characters immediately, and then I carry on from there with the day’s work. When I was a child in the funeral home I had to spend many long hours in silence. I wasn’t allowed to even move, lest the sound of my footsteps interrupted the mourners below. Perhaps you can imagine what a lifesaver reading was to me. I was particularly engrossed in series because I always knew what I would be reading next and that knowledge offered comfort. From a young age I was immersed in The Bobbsey Twins, Nancy Drew, The Hardy Boys – so much fun, and importantly, these characters led such different lives from mine. I had large swaths of time to engage my imagination. Things moved slowly in our small town, there wasn’t much to do, so I often did absolutely nothing but imagine, daydream and pretend. 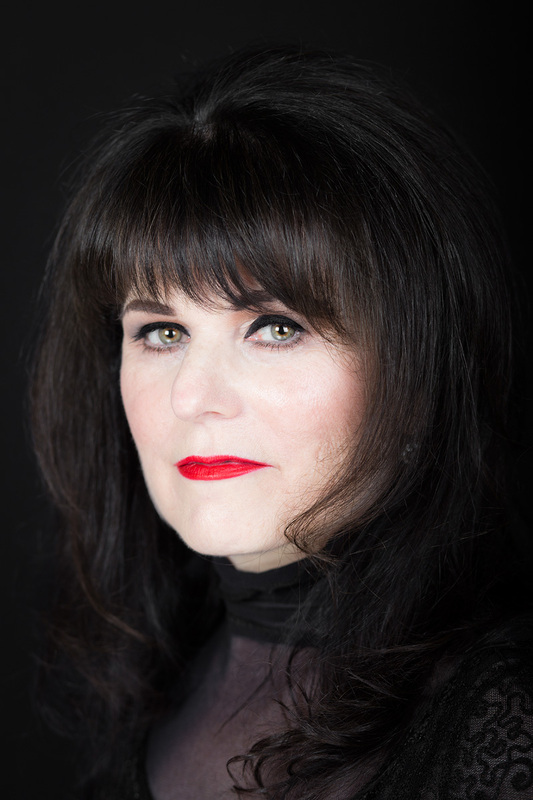 At first I used theatre and acting as a form of expression and a way to engage my imagination, but eventually I became more comfortable with writing and felt compelled to do so. I live in London and rely on its public transport upon which I do not read or write, unless I’m on a long-ish journey, and I do not listen to music. I listen to people’s conversations, I observe their behaviour and basically study them. It is so easy to be cut off from real life these days, and I spend so much time at my desk that when I’m out I like to fully use all my senses. Art inspires me, as does history, as does the land of the quirky and odd – wherever I may find it. Other writers inspire me tremendously. I find writing hard – period! It scares me, challenges me, and often frustrates me. There are all the words in the world from which to choose, yet sometimes I can’t find the ones I want to use. I’m always striving for the perfect word, or group of words, to complete a thought, create an image, or evoke a feeling. A first draft is such a mess, so tangled and woeful. Lassoing it all in, all the storytelling elements for which you are responsible, each must meld seamlessly. HARD! I have one goal at the moment: to transform all the story ideas that are swimming around in my head into novels with all the words in the right order, and to entertain readers with the result. On a broader scale, I’m tired of hearing and reading about the death of the book. It would be so much more helpful to spread the word about the marvelous ways that books are gaining wider audiences. The bookstores, publishers, literary magazines, and literary bloggers work hard to expand their audiences. Authors themselves have never worked as tirelessly to help promote their work. These are the stories we should be lauding. There are so many. In addition to the women mentioned in the next question: Susanna Clarke, Joyce Carol Oates, Sarah Waters, Donna Tartt, Hilary Mantel, Daphne Du Maurier, Angela Carter, Barbara Kingsolver.